← Should Auld Acquaintance Be Forgot . 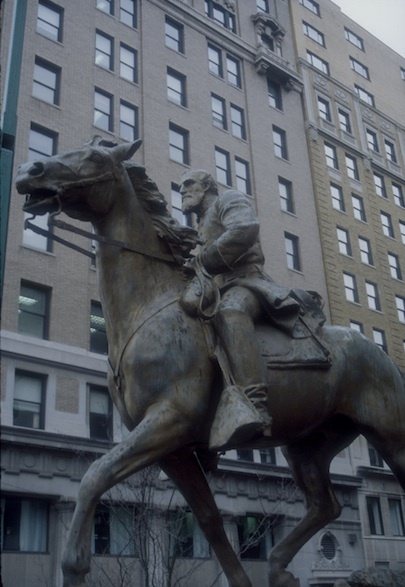 . .
Stonewall Jackson looks as determined as I’ve ever seen him, his eyebrows slightly furrowed, his eyes focused on the road well ahead of him as he gallops through a courtyard in downtown Clarksburg, West Virginia, the town of his birth. He wears no kepi, blown off, perhaps, because of his horse’s speed, although Jackson still sits straight and firm in the saddle. His right fist, gloved, clenched, held behind him slightly, helps him maintain balance. His left glove holds the horse’s reins between his second and third fingers. The bottom flaps of his coat whip in the wind. The horse—whom I somehow can’t think of as Little Sorrel, although that surely must be who it is—has the same sense of purpose evident in his rider. He holds his ears back as he gallops, his mane and tale both fluttering. His lower jaw muscles are tense, and the muscles of his hindquarters ripple with power. The horse looks wide-eyed, not panicked but not pleased. Jackson was notoriously awkward-looking on a horse, but he was nonetheless an excellent horseman. His Uncle Cummins, after all, had owned a racetrack not too far from here, near Weston, where Jackson grew up. This statue captures Jackson in a moment of noble grace. The statue was erected by the United Daughters of the Confederacy and sculpted by New York sculptor Charles Keck. A duplicate of the statue rides in place in a park in Charlottesville, Virginia. This one once shone a vibrant copper, but age has mottled it green-blue. The black marble base has lost its shine, and the plaque on it bears the stains of weather. The plaque quotes Bernard Bee, and it offers basic biographic info on Jackson, like where he was born and where and why he died. But, the plaque contains an interesting phrase, one I’ve not seen anywhere else: “Died…while fighting for a cause he believed to be just.” Most statues, plaques, memorials, and tributes tend to avoid the whole why of the fight, but here was an attempt to touch on it in a way that implies the cause might have been wrong but the commitment to principles was noble. This is, undoubtedly, my favorite Jackson statue. In Manassas, the Jackson statue bravely defies the blue troops. The statue standing over the grave in Lexington looks peaceful; the one at VMI, commanding. On Monument Avenue, the statue looks watchful, and the one on the capitol grounds looks content. The statue here in Clarksburg looks urgent but composed. He is a man on a mission. He is a man on a mission, indeed. This entry was posted in Battlefields & Historic Places, Memory, Monuments, Personalities, Photography and tagged Charles Keck, clarksburg, Stonewall Jackson, Stonewall Jackson statues, Stonewall-statues-series. Bookmark the permalink. very interesting foto story. well done, as usual. enjoyed it much. Thanks much, Joe. I appreciate the good words and your continued readership!